Downtown areas in American cities have dramatically redesigned their cities with bicycle infrastructure in recent years. Unfortunately, San Diego was not among the early adopters. Currently, the downtown core of San Diego has no bicycle lanes. In addition to the lack of dedicated infrastructure, many of the roads serve high volume, high speed traffic from the 3 connecting freeways. Clearly, bicyclists have not been a priority for the transportation planning in downtown. However, we are hopeful this significant oversight will be corrected with the implantation of the Downtown Mobility Plan. 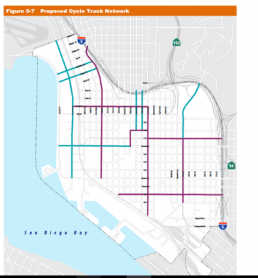 On June 21st , the San Diego City Council passed the Downtown Mobility Plan. We have previously expressed our enthusiasm for the plan. We are very grateful that the plan passed without any major revisions requested by opponents. 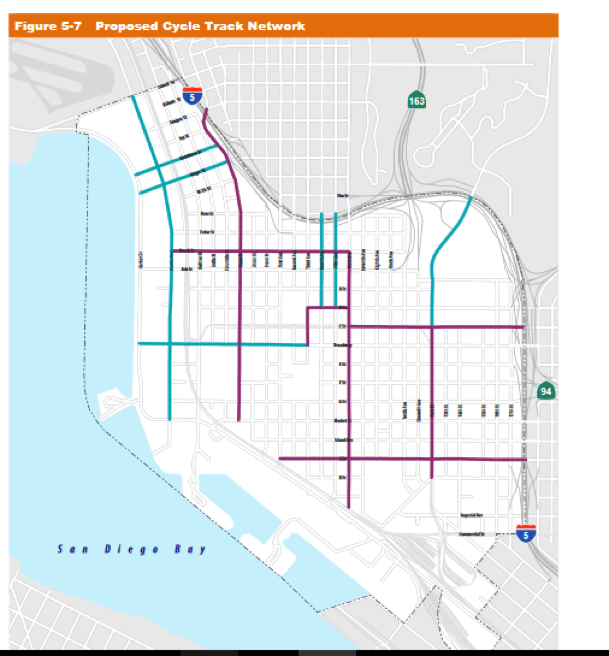 The plan creates an entire network of protected cycle tracks and greenways throughout downtown. When opponents from Little Italy pleaded for sharrows instead of cycletracks, Todd Gloria discussed the differences of riding by himself where sharrows may be sufficient but his preference for enhanced facilities when riding with his niece and nephew. Gloria and Civic San Diego planner, Brad Ricther, emphasized the plans intended outcome of encouraging new riders with protected facilities. While City Council approved the plan, the plan requires further political support to ensure implementation. And San Diego bicyclists are very familiar with planning fatigue. Will the downtown mobility plan gather dust with so many other well intentioned studies and plans? We are optimistic that city staff will implement Civic San Diego’s plans. Mayor Kevin Faulconer has committed to building the cycle track network within 3 years as a part of his climate action plan. Bike San Diego will continue to advocate for a better downtown and a full implementation of the downtown mobility plan. A reader wrote in about a collision that happened yesterday morning at Catalina and Wilcox in Point Loma. the cyclist was hit when the van turned left across traffic hitting cyclist coming in opposite direction. Cyclist was hurt but was told she would be ok. That is all I know. Be careful on Catalina at all times! According to our source, the cyclist that was hit was an aspiring youth cyclist who was just 10 years old. The young cyclist was taken to the hospital. The cyclist's father was also riding with his daughter when the collision happened. He declined help offered by fellow cyclists. I can only imagine that the father must have been terribly shaken by the incident. The other source reporting this collision states that the "cyclist suffered from fractured leg and collar bone, which police said were not life-threatening." Our source stated that the Chevy van responsible for the collision was a government issued van driven by a Navy enlisted man. From the looks of van in the above photo, it is a miracle that the young girl is even alive. We send the both cyclists and their families our thoughts and wishes for a speedy recovery.